Circa 1931. On the Island Of Inishool, with Malachy’s Island in the background. 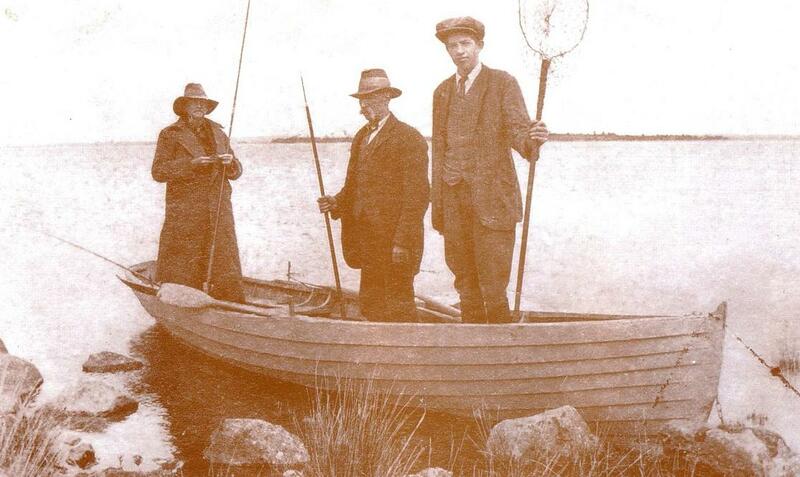 To the left is Kingsmill Moore, Senator, High Court Judge, fisherman and author. He is accompanied by Jamesie and Bill Donnellan, both of whom he mentioned in his famous book “A Man May Fish”. A channel deep enough to take a small lake steamer twists down the centre of Oughterard bay. To the east of it stretch rocky shallows, to the west, between the channel and the shore, lies an expanse of sand brought down by the river. Over the sand the water is of an even depth of about six feet, save where a few shreds and snippets of reefs break the surface, and though rarely productive in day time, this was a favourite evening drift of Jamesie’s, whose style of fishing it suited. Here he picked up another fish which revived his good humour, always a little in abeyance when the rival rod was ahead of him. …James was willing to be helpful, even forthcoming, in a discussion on flies, but when it came to the business of catching fish, he was a different man. He liked fishing, liked better to catch fish, but best of all he liked to show his superiority over rival boatmen. This was a necessity for his complete happiness. He would rather bring back a mediocre catch which was larger than that of any other boat, than a really good bagwhich only took second place. So far so good. Anyone fishing with Jamesie could be certain that he would leave nothing undone to get fish. But it did not end there. He craved also the personal triumph of beating the other rod in his own boat, and to make sure of this he was willing to use devious methods. He did draw a line. I have heard him refer with disapproval to leaving his companion’s fly-box behind or weakening his gut by the touch of a cigarette. Physical interference was a foul, but when it came to a contest of wits anything was permissible. The late Kingsmill Moore was one of the most respected men in Ireland in the decades before his death. “A Man May Fish” has become a classic since it was first published in 1960. The work covers a lifetime of fishing for trout, sea trout, and salmon. This page was added on 07/07/2011.